Samsung showed off its SSD 830 series, an upcoming solid state disk with the SATA III interface. It will ship in October. Samsung Electronics Co., Ltd., a global leader in digital media and digital convergence technologies, announced today its new lineup of advanced internal solid state drives (SSDs), the Samsung SSD 830 series, will be available in October to consumers. The new drives incorporate a high-performance Serial ATA Revision 3.0 interface, doubling the data bandwidth of Samsung’s previous SSD product, the SSD 470 series. The advanced feature set dramatically increases performance, making the new drives a good fit for anyone desiring an extreme computing experience without purchasing an entirely new PC. “Solid state drives have long been the preferred choice for those seeking the very best in performance,” said UnSoo Kim, vice president of memory brand product marketing, Samsung Electronics. 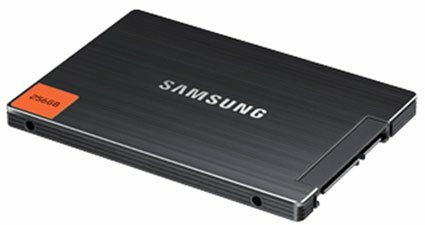 “With the Samsung SSD 830 Series, we are raising that performance to even higher levels, while also delivering unparalleled Samsung design and convenience in the package.” The Samsung SSD 830 series is distinguished by its stylish and chic exterior, delivering precision engineering inside and out. The new high-performance drives come in a brushed metal enclosure, highlighted by a deep black tone, which effectively embodies Samsung’s legendary SSD performance and reliability. The orange accent in the corner identifies the drives as Samsung. SSDs utilize flash memory for data storage rather than the spinning platters found in conventional hard disk drives. This results in much faster performance, lower energy consumption, reduced heat output and improved reliability without risk of a hard drive crash. The new SSD series builds on the success of the acclaimed 470 Series SSD. Samsung’s proprietary firmware, the brains of the drive, delivers exceptional performance. Samsung, unique among SSD manufacturers, engineers all of its components in-house. This allows it to meticulously fine-tune its hardware and software for enhanced reliability. In addition, the included Samsung Magician software keeps the SSD running at its peak. Samsung's full upgrade package delivers a superior user experience and a safe and easy upgrade solution. By eliminating the need to reinstall applications, manually move data, and reconfigure user settings, the included Norton Ghost software reduces the time it takes to upgrade to an SSD by up to 75%. The bundle includes a bracket for installing the 2.5" drive in a 3.5" bay, all required cables, and detailed instructions. Notebook upgrade kits include a USB to SATA adapter cable. The Samsung SSD 830 series will be available in capacities of 64, 128, 256 and 512GB. Detailed features will be disclosed at the official launch, which is scheduled for October.